If someone told you that Metro lost a key player midway through the first half, you'd be concerned, right? There is no way Metro would be able to hold the fort the rest of the way, right? Go figure! In fact, Metro made it look easy, dominating the entire game and trashing West-leading Dallas 3:0. At times, it looked like Dallas was the team down to ten. Two changes were made from the last regular season game: Connor Lade for Ethan Kutler and Alejandro Romero Gamarra for Alex Muyl. 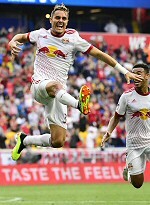 Metro broke through in the 23rd, when Tyler Adams picked up the ball at the edge of the box and took it to the endline. From there, the youngster centered it to Bradley Wright-Phillips, who was standing at the doorstep for an easy tap-in. Two minutes later, a clumsy unnecessary tackle from Daniel Royer saw VAR issue him a straight red. But Jesse Marsch didn't panic, changed little, and Metro continued to press on. Metro defenders scored on either side of the half. In the 39th, off a corner, Aaron Long acrobatic sideways kick pierced the back of the net. Then, in the 48th, what looked like a harmless shot from Kemar Lawrence beat Jesse Gonzalez at the supposedly-guarded near post. From there, the game was effectively dead, with Dallas feebly trying to break through the backline, only to be thwarted time and again. For years, we've been complaining when Metro plays a man up, as they never seem to do well in such situation. Well, today they dominated while being a man down for the majority of the game. Lineup: Robles, Lawrence, Long, Parker, Lade, Adams, Davis, Valot, Royer, Romero Gamarra, Wright-Phillips. Subs: Muyl, Etienne, Collin.